As a distributor for MD Helicopters in sub-Saharan Africa, Safomar Aviation is proud and honoured that the MD 500 Series helicopters have been selected as the best civil helicopters of all time. The hands-down winner in a December 2014 survey conducted by Vertical Magazine, the MD 500 Series helicopters sit atop a Top Ten list that includes rotorcraft designs from the earliest days of flight to modern-day innovators. The commercial Hughes Model 369H was certified in November 1966 and pilots quickly fell in love with its high-speed performance and many lives were saved by the aircraft’s highly crash-resistant teardrop-shaped A-frame cabin design. 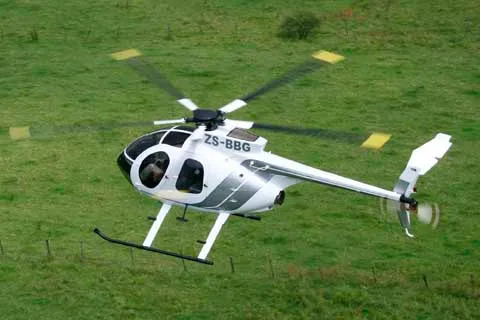 Since 1963, the MD 500 series has been built and upgraded by Hughes, then McDonnell Douglas and most recently MD Helicopters, Inc.
Agility, high cruising speed, load capacity, low cost of ownership and exemplary hot-and-high performance make the 500 series, especially the MD530 ideally suited for African operations. These can range from corporate transport, game management, paramilitary duties, law-enforcement to fully-fledged military operations as a highly versatile and battle-proven light attack helicopter. For more information on the MD 500 series contact Safomar Aviation.